Bill Bruford is certainly best known for his work as drummer in Yes and King Crimson. Those who have followed his solo career know that his big love is jazz and most the works outside of the aforementioned bands are tied in one way or another to that musical style. 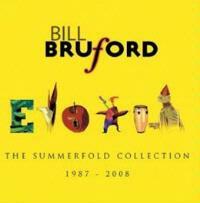 This double disc set is a compilation of releases on Bruford’s own Summerfold label – see the Winterfold collection review in this same issue. The disc is included in the progressive rock section mostly because of Bruford’s importance to that genre, but some of this music fits into fusion and RIO genres. This is a great disc and would serve as an excellent introduction to Bruford’s lesser known work. It should be noted that I have reviewed several of the songs here on their original albums and have modified those reviews for use here for the sake of consistency. This comes from the self-titled first disc by Bill Bruford’s Earthworks. Starting with a slow, bouncy progression, this one builds in a more electronic sounding modern way. Eventually more traditional jazz elements emerge over this backdrop to carry it onward. As they smoothly transition the number it becomes one of the most effective and powerful jazz progressions on the album. This one features some exceptionally tasty soloing and textures. They move it over the course of the piece through several interesting and varied changes. The groove and sense of fun are never lost, though. Feeling like a jazz take on King Crimson's "Thela Hun Ginjeet" on the rhythmic structures, the over layers seem to convey an Asian texture at times. It moves into some varying segments, but still holds its general themes, but intensifying the energy. This comes from the same album as the previous number. Coming from Bill Bruford’s Earthworks’ second album, Dig, a fairly sedate, but very dramatic rhythmic section begins this and then horn starts to weave lines of melody over the top as this is gradually built up. There are some really cool bits later that I think are Bruford’s electronic percussion. Although, perhaps it’s keyboards. It doesn’t really seem to have the attack of percussive instrumentation and yet there’s an almost xylophone element to it. The track doesn’t cover a wide variety of musical territory, but it covers it well. A playful texture leads this off and although there’s a bit of a weird modern electronic sound to this it feels very much like some old school jazz. Of course, that applies mostly to the extended intro. They take it out into a groove that has a much more modern sound, although there is still a bit of a tongue in cheek weirdness felt on much of this. This is also from Dig. It is quite a dynamic piece and works through a number of intriguing changes, moving between nearly pure jazz and something closer to Rock In Opposition. There are moments that feel like, in different formation, they might have been at home on an album by Louis Armstrong. Hailing from the All Heaven Broke Loose album, this comes in tentatively and becomes more complete and cohesive as it continues. There is a nice mix of King Crimson type pounding, modern fusion and pure jazz stylings on this. It’s an exploratory piece that covers a lot of musical territory, too. I love the standup bass dancing in the backdrop through much of the track. Although this comes from the same album as the previous piece, the tone and modes are quite different. This is mellower and far slower. It’s got a more pure jazz texture to it. This is pretty and a nice addition. Some weird electronic elements start this and show up here and there throughout. The killer funk jam that makes up the bulk of this tune is simply awesome. They throw in bits of weirdness at different points along this ride, though – including an excursion into King Crimson like ambient space. This comes from the live Earthworks album Stomping Ground. The final track from Bill Bruford’s Earthworks’ first disc to make this set, they come in mellow and sedate on this with a killer smooth jazz groove. This one doesn't wander far; instead content to stay in a pretty and potent mellow mode. Coming from the album of the same title, “If Summer Had Ghosts” starts with bass. From there they launch into a tasty jazz journey with a lot of acoustic guitar woven into its musical tapestry. There’s a killer acoustic bass solo on this. Acoustic guitar starts this off and there’s almost a folk rock texture to the cut – although it still fits nicely into the jazz realm. This comes from the same disc as the previous number. It’s quite a tasty number and one that gives each of the musician their time to shine. Coming from the A Part and Yet Apart album, this is a lot mellower and more pure jazz in nature than some of the other material on this set. It’s quite a nice smooth jazz journey. They do power it up a bit later, but never lose sight of the prize. The piano truly drives a lot of this, but the tenor sax also gets a chance to steer. This was originally released on the same disc as the previous cut was. The pure jazz modes are as much in play as they were on the previous number, but this gets a lot more energized and powerful than that one. It’s really a killer jam that just plain wails. Here is a pretty much pure jazz journey. It’s set in a nice groove and is quite tasty. This comes from the album Sound of Surprise. This has a great piano solo. They also take us into some cool dramatic modes (and Bruford gets to show off) around the five and a half minute mark. The title track to the same disc that gave us “Revel Without A Pause,” Bruford’s percussion starts it and holds it for a while. After a time saxophone joins and we begin this ride. Keep your hands inside at all times as this is a pretty thrilling one. We get some Eastern modes along this journey and it’s a purely jazz romp that’s quite potent. Coming from Every Step A Dance, Every Word a Song, this is very much a rhythmic showcase. There is melody, too, but Bruford really dominates most of this track. Even the melody (Michiel Borstlap) is often quite percussive in nature. A live cut, this does move through a number of changes and alterations and is quite powerful at times. You can tell that it’s a crowd-pleaser, too. The piano leads this off, building a pretty melody. It shifts towards dissonance a little before the half minute mark and then returns to melody, feeling darker. Percussion enters tentatively and builds quite deliberately. The percussion rises to a noisy sort of cacophony as the piano twists into weird territory. This becomes an experimental free form sort of piece for a time and then settles back down to more gentle melodic motifs. The drums rise again, bringing with them more chaos, but the piano climbs also keeping its head above the water this time. Then they settle into a more traditional jazz piano/drum jam. They move through a few alterations. At times it becomes more noise oriented and then it shifts back in favor of the melodic to finally end. This comes from the Bruford and Borstlap CD In Two Minds. Coming from the same album as the previous composition, this starts in with a cool, tuned percussion sort of sound. They take it in with a killer jazz jam from there. This has a lot fuller sound and a bit more of a “rocky” fusion element in play than the previous one. This is frantically paced and, while at times it can be a bit challenging in terms of its scope, is a considerably accessible piece of music. They move through a number of differing movements and motifs in the process of creating this sonic tapestry. Once more it serves as a great showcase for two talented musicians. It turns more into a sound that fits with the earlier cuts for the second half of the number. A live cut, this is a percussion marathon. It features Bruford on drums, of course, but he’s joined by Doudou N’Diaye Rose (sabar), Chad Wackerman (drums) and Luis Conte (conga drums). This is quite tribal and certainly of interest to drummers. For my money I’ve never been crazy about drum solos, but this is in a whole other world and really rocks. It comes from the album A Coat of Many Colors. Coming from Earthworks Underground Orchestra, this live one starts with music that reminds me of something from Vince Guaraldi. It fires out into a screaming jazz jam that’s frantic and powerful. This is one of the best cuts on the whole set. It’s full of energy and just plain oozes “cool.” At almost ten and a half minutes in length they’ve got a lot of room to play and they make great use of it, working through a series of tasty moods, modes and jams. We return to the Sound of Surprise album for this composition. It starts with a piano solo that’s quite intricate and pretty. Eventually the other instruments make their debut and they start to build this into another tasty jazz outing. It’s another extensive piece, weighing in at nearly ten minutes and covering lots of different musical textures. At times it’s quite sedate, but they bring it into more energized and intense sounds at other points. This cut starts with percussion that reminds me of “Thela Hun Gingeet.” They take this into a somewhat freeform, but still cohesive and rather “groove oriented” jazz jam from there. It makes its way through a number of changes and alterations in a killer arrangement that has shades of mellower and more intense music. There’s a great section that’s more stripped down and laden with middle Eastern musical flavors. It feels like something out of a movie soundtrack, but gets quite involved as the percussion takes control. This number comes from Random Acts of Happiness. This recording has never been released before on Summerfold. It’s a frantic fusion number that’s got quite a few differing moods and motifs. It’s a great piece of music and a great way to end things on a high note. Of course, just about anything from either of the two discs would have done that.